1. Spread out the slices of watermelon on a chopping board. Squeeze over the juice of ½ lime and, using a 10cm cookie cutter, stamp out 4 discs from the slices; set aside. Blanch the samphire in a pan of simmering water for 1 minute. Drain, refresh under cold running water, then set aside on kitchen paper to cool. 2. Put the avocado, crème fraîche and remaining lime juice in the small bowl of a food processor. Whizz until fairly smooth, then season. In a separate bowl, mix the crab meat and mayonnaise; season. 3. Put a disc of watermelon on each plate. Dress with a little oil and sea salt, then scatter over some mint. 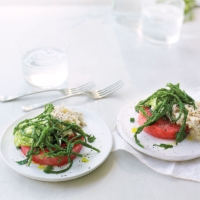 Spoon the crab and avocado on top, then finish with the samphire and a grinding of black pepper.